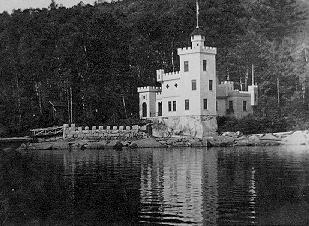 Norwood Castle is located on Sebec Lake, Maine; the lake is approximately two hours north of Augusta off of Interstate Route 95. The Packard family owns and runs over one hundred cabins located around the perimeter of Lake Sebec. It is a very scenic and peaceful lake for swimming, fishing, hiking and relaxing. There is actually even a small airstrip where the Packard family & friends have at least one, if not more, World War II vintage fighting planes they have restored and fly frequently! Norwood Castle is now commonly referred to as The Castle by the residents of Lake Sebec; you can actually boat or row close to the shore of the castle!! A little history on The Castle: in the 1880s, an attorney by the name of Willis E. Parsons visited Europe and was quite inspired by the European castles and fortresses. Attorney Parsons practiced law close to Lake Sebec in Foxcroft, Maine, and was so inspired by the castles in Europe that he decided to build a castle on the lake. As a true romantic, he had the castle built in the 1890s for his new bride, Agnus. So, French-Canadien workers built the castle for $1200 in the 1890s. The Castle is constructed of wood and has a granite rock foundation, clearly seen in the picture dating from the early 1900s. The Castle is colored all white with black accents, and does now have electric power and running water. Although The Castle has withstood many fierce New England winters, the roof did have to be replaced this past summer. The Castle still stands today and is still occupied and owned by descendants of the same Parsons family.